This weekend, many of you (most of you, we hope…no, all of you!) will be settling down with your binoculars and a cup of tea to do the RSPB’s Big Garden Birdwatch (BGBW). The idea is a simple one. You spend an hour watching the birds in your garden, and recording what you see – not the total numbers, but the highest number of each species that is present at any one time. If you don’t have your own garden, you can use any suitable local patch – the park, the school playground, or whatever. 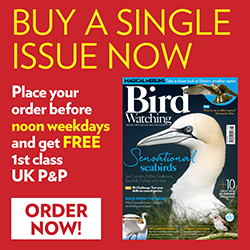 What you might not realise is that this has been going on for 40 years now, and in the process has produced invaluable information about the health or otherwise of Britain’s bird populations. Martin Harper, the RSPB’s Global Conservation Director, says that the people who dreamt up the idea in the late 1970s would have been amazed to find more than 500,000 people taking part every year. The growth of the RSPB’s membership since is testament to the success of BGBW and other intitiatives in engaging people who have an interest in nature. Martin says that BGBW plays a part in reinforcing messages and trends, and is a way of putting a spotlight on certain issues. The timing of the event is down to a number of factors, not least that the end of January is when garden bird feeders are likely to be at their busiest. But the RSPB are always looking for new ways to enthuse people about the natural world, and Martin said that they’d love to hear from anyone with ideas for similar mass-participation surveys and events. So what have Martin and his children recorded in their Cambridge garden during past Big Garden Birdwatches? Blackcap is an occasional winter visitor to my own garden, so I’ll be looking out for the sweet-singing warblers too over the weekend. If you’re not doing so already, why don’t you give it a go?